Central heating is included in the rental price for the cold season, however, there is a minimal charge for firewood. A 30% deposit will hold the reservation, and the balance will be due upon arrival. Deposits can be paid by credit card. Simply click on the button below, and enter the amount of your payment on the following page. A PayPal account is not required in order to pay by credit card. In addition to credit card payments, traditional bank wire transfers and checks in Euros are accepted. Terms to be discussed upon inquiry. Please contact owner for details. The 30% deposit is non-refundable. The deposit may be applied towards a future booking within one year of the date of the original reservation. Cancellations must be made no later than 4 weeks prior to the reservation date. All guests are advised to arrange holiday insurance, including medical cover as required. The owners cannot accept responsibility for accidents. 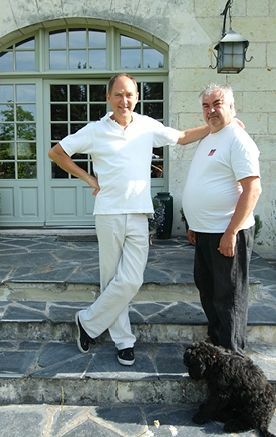 The owners of Le Manoir and Maison Louis Richard will not accept any liability for any loss, injury or damage of any nature whatsoever sustained to or by any person in the course of their occupation of the properties or any activity carried out in the course of such occupation wheresoever sustained, such activity and occupation being carried out at the individual’s own risk. Le Manoir de Champfreau is located 12 km east of the city of Saumur, which is between Tours and Angers. When driving from Paris, take the A10 autoroute, then the A11 (l’Océan) in the direction of Nantes, and then the A85 following the signs to Saumur. If you take the train from Paris to Saumur there is one change over, either in Tours or in Angers. The Saumur station is 10 minutes from Le Manoir. Car rental can be arranged with EuropCar in Saumur or rentals in Tours or Angers. Tours and Angers are one hour by car.